HRANA News Agency – Ma’ed Shabani Nejad, 15-year-old girl from Abadan who was arrested by intelligence forces, was released on the bail after about 12 days on October 29, 2017. According to the report of Human Rights Activists News Agency (HRANA), the intelligence Office of Abadan detained a girl named “Ma’ed Shabani Nejad (Amouri)”, born in 2002, on October 18, 2017. The intelligence office had arrested the student at her high school located in at station 7 and transferred her to the unknown place by surrounding the house of Shabani Nejad. Ma’ed Shabani Nejad is studying in high school in the first grade, and it is said that she writes epic and national poetry in Arabic and presents them in the social network. 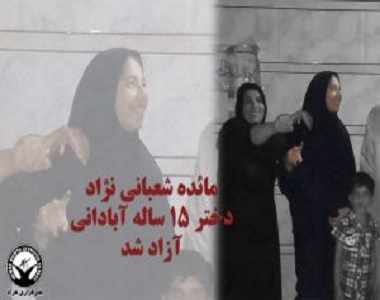 On the eve of the thirteenth day of the arrest of Mrs. Shabani Nejad, her family succeeded in providing the bail of 2 billion IRR issued by Branch 2 of the Revolutionary Court in Abadan. The Arab girl was released on October 29, 2017.